In the current issue of Governance (22.4), Mary Alice Haddad says that Daniel Aldrich “has written an extraordinary book” about political struggles over the location of unpopular facilities in Japan. Site Fights is a “methodologically sophisticated book” that describes the tactics used by communities and government agencies in the struggle over facility placement. 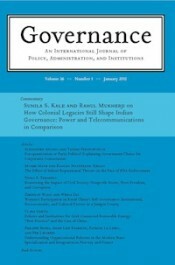 Also reviewed in the current issue: Michael Martinez, William Richardson and Camilla Stivers on administrative ethics; William Genieys and Marc Smyrl on policy elites; Lesley McAllister on environmental protection in Brazil; Cornelia Woll on the ways in which governments shape business attitudes about global trade liberalization; and Herbert Gottweis and Alan Petersen on the governance of “human biobanks.” Read the reviews here.